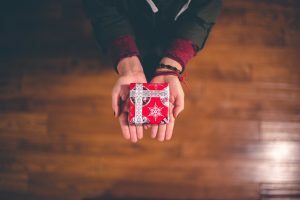 What Are You Giving For Christmas: Are You Willing to Give A Deliberate Gift? I could see the tears of regret well up in his eyes as he told me the story of his past eighteen years. My coaching client was a very successful businessman when it came to making money, but by his own admission, he was a failure as a father. He had a “take charge” demeanor and seemed embarrassed to show emotion. On the outside he appeared to have it all: trophy wife, nice cars, beautiful house and smart kids, Yet he had missed the boat when you looked beyond the facade. “No. It’s a tragedy,” he replied. He promised to enter his boy’s world daily by no longer trying to control him, but by allowing him to have his opinion without shaming or belittling him. He also committed to become as interested in the things that his son loved to do as his son was! Life has a way of slapping you up the side of the head when you are not at living deliberately! As I later reflected upon this situation, it came to me that as a leader, a spouse, a parent, a friend, etc., YOU MUST BE DELIBERATE about your life. It is futile to come home from work and offer your loved ones exhaustion, anger, apathy, resentment, the “I’m too tired attitude”, indifference, etc. By the same token, you cannot offer your employees, co-workers, or workplace a bad attitude, a victim mentality, a blaming finger, rationalization, or mediocre effort, etc. YOU MUST BE DELIBERATE ABOUT YOUR LIFE! This is your life. It’s passing. What are you waiting for? In the big picture of your life, what do you want? What kind of relationships do you want in the work environment and at home? There is no greater gift to give during this holiday season and into 2019 than the gift of living a more deliberate life. Miracles take place when you deliberately connect with the big picture of your life and understand that you exist for a reason outside of yourself. When you are deliberate, you are a better leader. When you are deliberate, you are a better loved one. When you are deliberate, you sleep more peacefully at night. Here are some simple ways to give “deliberate living” this Christmas. Give the Gift of Living Deliberately This Christmas. Ask yourself, “Where do I want to be more deliberate?” Listen to your heart. It will speak truth to you as it did to the father in the story above. Ask yourself, “What is one key thing I can do to be deliberate in this area?” It might be deciding to spend more time listening to employees, co-workers or loved ones. It might be asking more genuine questions and simply listening. Remember, you listen with your heart, not with your ears. Make it fun by keeping score. Give yourself 5 points per day for being deliberate. Score yourself from 0-5 with 5 being the most deliberate. Each week, you could earn 35 points. Give yourself a fun reward for accomplishing your weekly goal. Track this for a month and you will be amazed at how this simple little exercise of being deliberate can change your life! Love this Doug! Thank you for the inspiration this morning – I love it. Merry Christmas to you and your family too. I really enjoy the quotes of the day.